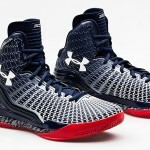 Though the Under Armour ClutchFit Drive debuted on NBA courts at the end of last season, tomorrow, Tuesday, August 19th, will mark the first time that UA’s newest technology will be available to the public. First seen on Cam Newton’s Under Armour signature football cleats, the ClutchFit Drive technology will be incorporated on a basketball shoe. Debuting in USA “Home” and “Away” Stephen Curry PE colorways, the ClutchFit Drive features an upper that acts as a second skin to better support your on-court movements and provide greater flexibility in a high top by molding to your foot. 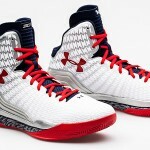 The Drive sits on top of a full Under Armour Micro G cushioned midsole and includes an external heel counter for reinforced stability. The Stephen Curry USA ‘Home’ and ‘Away’ Under Armour ClutchFit Drive PE’s arrive on Tuesday, August 19th for $ 125 each at select Foot Locker stores. Check the Launch Locator to see which stores will carry these releases. Print article This entry was posted by hhcblog on August 18, 2014 at 1:58 pm, and is filed under Footwear. Follow any responses to this post through RSS 2.0. You can leave a response or trackback from your own site. No Place Like Home Under Armour goes low profile with the new Curry One Low. The home inspired colorway features a royal upper along with yellow and black accents. See more images below and pick these up in stores or online (10am EDT) Friday, July 3rd for $ 110. Check out Launch Locator for stores.